Sander Lylloff from Copenhagen, Denmark outlasted a field of 543 players to win the opening event of the fourth season of the PokerStars.com EPT. The former junior chess champion and world class backgammon player can now add poker to his mastery of games after his first place victory at the EPT Barcelona. Click here to check out our video interview with Sander just after taking down the title , along with all the other videos from this event. Hand #105: Lylloff raises to 120,000, Teltscher re-raises to 260,000, Lylloff moves all in and Teltcher calls. Teltscher turns over while Lylloff shows . The flop is . The turn is the , making Lylloff trips. 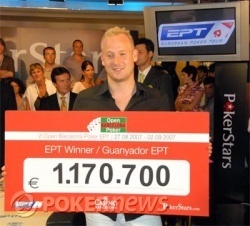 The river is the and Sander Lylloff is the 2007 EPT Barcelona Champion, winning €1,170,700. Teltscsher receives €673,000 for his runner-up finish. Click here to check out our video interview with Mark just after heads-up ended, along with all the other videos from this event. Hand #103: Lylloff raises in the dark to 120,000 and Teltscher calls. The flop is Q-J-7 rainbow and both players check. The turn is a 9. Check-check again. The river is a 5. Lylloff bets 40,000 and Teltscher folds. Hand #104: Teltscher raises to 120,000 and Lylloff calls. The flop is . Lylloff checks, Teltscher bets and Lylloff folds. 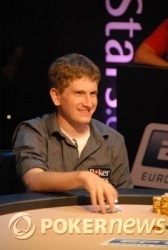 Can Teltscher win his second EPT event? 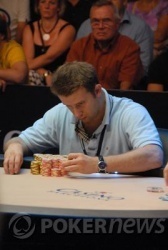 Mark Teltscher won EPT London in October of 2005 during Season Two. He beat Jonas Helness heads up for the victory. Also at his final table was Russian pro Kirill Gerasimov. Although Mark Teltscher is behind 2 to 1 in chips at the start of heads-up play, he is trying to become the first-ever player to win two events on the EPT. Hand #100: Lylloff raises to 120,000 and wins the blinds and antes. Hand #101: Lylloff raises to 120,000 in the dark and Teltscher calls. The flop is . 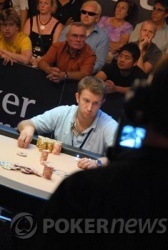 Lylloff bets 200,000 and Teltscher folds. Hand #102: Lylloff gets a walk in the big blind. Play has been paused as the table is prepared for heads-up play between Mark Teltscher and Sander Lylloff. Click here to check out our video interview with Greg just after busting, along with all the other videos from this event.